When I met Erin, she came up to me with her sweet mother to my booth at the Bridal Extravaganza a few months back. Her demeanor was joyous & her smile was gorgeous. I was so happy to talk with because they were both smiling ear to ear and expressed they enjoyed the work I had out on display. She explained her fiance's name was Jerry & their wedding was at a venue called La Rio Mansion in Belton, Texas. I have photographed weddings at dozens of venues over the years & I remember telling myself put a star next to her name & look up her venue when you get home. This was my way of telling myself I really enjoyed their conversation & was intrigued about learning more about the venue as well by how they were describing the setting. I looked up her venue & fell in love with the online images & I can honestly say, this will be one of my most anticipated venues I will look forward to photographing in 2018. 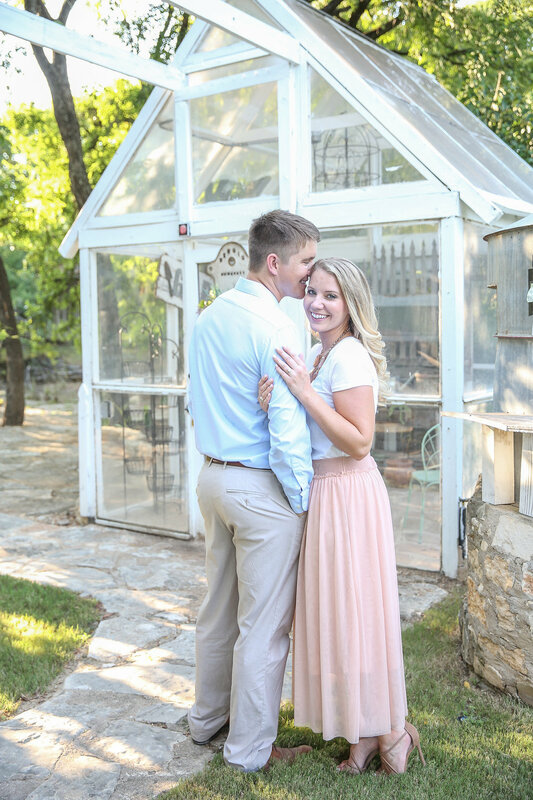 Fast forward to Erin & Jerry's Engagement session on an evening in mid-July. I had a 12 hour wedding the day before & I had learned a valuable lesson on which shoes NOT to wear (post coming later). I put on a sun hat, put on the Dr. Scholl's for my my poor feet in my short wedges & took a mini road trip up to Salado, Texas to meet the couple. I was feeling exhausted from the day before & also from photographing another Engagement session in the 104 degree Texas heat for two hours earlier in the day. I drove in to town and starting to immediately fall in love with the old town architecture and quaint feel of the town. I was 'downtown' Salado & a car would pass down Main Street every two minutes. It was nice to get out of the fast hustle and bustle of the hurried Austin scene for a while actually. When I saw Erin & Jerry, I was all smiles because I could tell they had read through my Style Guide & really prepared for their session. Oh & did I mention the sunlight was heavenly? We scoped out the area a bit and out of nowhere, as if it were out of a Hawaiian landscape, a mini forest of green bamboo appeared & I immediately knew we should start there for location #1! The entire session was a blast. We talked, we walked and we laughed. 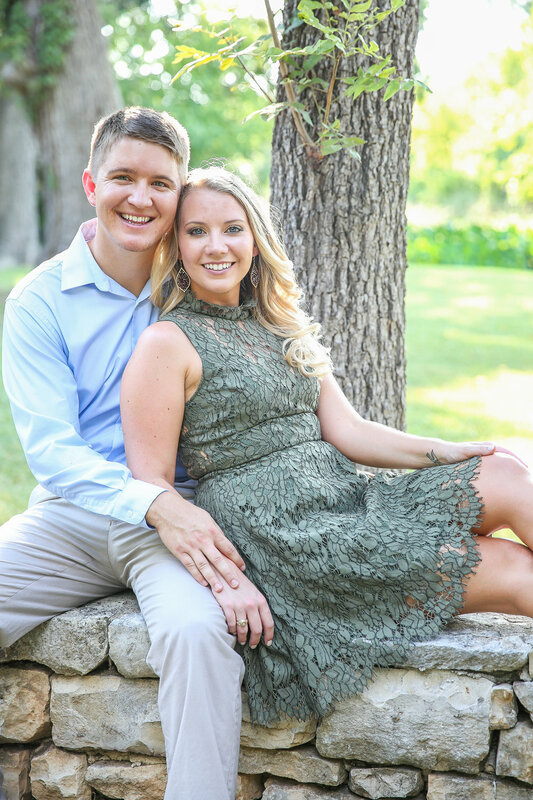 This couple has a very amazing proposal story that actually takes place here in Salado. We found this wonderful all white painted wood building called The Stagecoach Inn. They explained it had recently had a makeover & might I say, I absolutely loved having a crisp white deck to capture this couple. We drove about half a mile down Main St. because Jerry had told us about a small greenhouse he had seen & it was gorgeous. They danced like no one was watching & that skirt of hers twirled just perfectly! We had fun acting like the Beatles while crossing the street and stumbled across this cute brick sidewalk that the light was hitting just perfectly. We drove back to our original locatin just behind the brewery a little ways down & I saw a little bit of brush and a creek that caught my eye. As Jerry & Erin told me the story of their proposal, they explained he actually proposed to her on his birthday because her family was in town. They were on their way to the town's Brewery, called Barrow Brewing Company to celebrate his birthday...or so Erin thought! What actually happened is Jerry pulled over on the side of the road, walked her down near the creek & proposed. She said she was so surprised and thrown off because it was his birthday. They met up with friends an family after she said yes of course & had a great nights together at the brewery. It was a great night & a story that will go down in their family history for a lifetime. When it's Mid-July in Texas, and you're doing an Engagement session outside and then at a brewery, you get a beer! That's just what we did. I took a few photos of the two enjoying their cold drink as we relaxed and got to know each other a bit better. Perfect lighting, a great couple, client's who have a great outfit selection and being able to share stories over a beer-what more can a girl ask for?! the answer is nothing. It was perfect, they were perfect & so in love. It was just about time to head back, but as we talked more, I let them know I had seen a very large mural of the Texas flag painted on the side of an old building. It was on the side of the highway on my way up to Salado about 15 minutes south. I asked them if they wanted to go check it out & take a few photos in front of the building to end our session & they said yes! Check it out for yourself! Once we found the building, we found not one, but TWO Texas murals, which are currently now my absolute favorite Texas backdrops. 1) Traveling to a place really makes me even more passionate about my photography. 2.) I am even more eager in my efforts scoping out my surroundings, finding good lighting, utilizing the gorgeous scenery and capturing the perfect frame. 3.) Most of all, I learned that by asking Jerry & Erin questions about their love story, it gave me a window in to what makes the connection between the two spark. Their story is unique and hearing more about the behind the scenes details really makes me excited to be their photographer for their big day next spring. I can try, but I can't promise that I won't be emotional during their wedding ceremony, that is for sure.